Whoa boy: another Sears whopper. 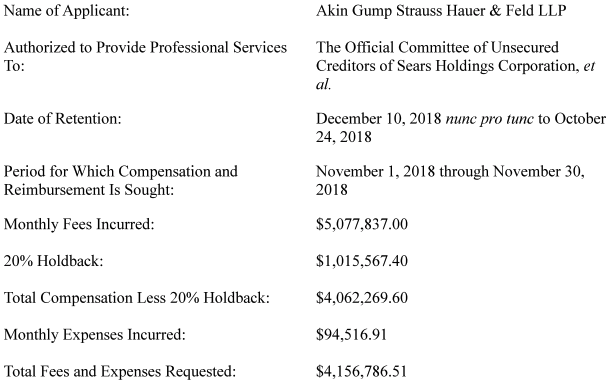 Akin's fees in November...repeat, NOVEMBER...BEFORE discovery and the multi-day sale haring were nearly $5.1mm. The final numbers for this case are going to be in the stratosphere. WAAAAAAY back in September 2018, we highlighted in our Members’-only piece, “Online Education & ‘Community’ (Long Helen Mirren),” that esteemed author and professor Clayton Christensen was bullish about the growth of online education and bearish about colleges and universities in the US. We also wrote that Masterclass, a SF-based online education platform that gives students “access” to lessons from the likes of Helen Mirren (acting), Malcolm Gladwell (writing) and Ken Burns (documentary film making) had just raised $80mm in Series D financing, bringing its total fundraising to $160mm. Online education is growing, we noted, comporting nicely with Christensen’s thesis. We have compiled a list of a$$-kicking resources on the topics of restructuring, tech, finance, investing, and disruption. 💥You can find it here💥. Conway MacKenzie is seeking senior-level professionals as part of a significant expansion of their Houston office. In addition to Restructuring candidates, they are seeking senior level practice leaders and support staff specializing in Transaction Advisory Services and Litigation Support Services. Applicants are required to have 10+ years of relevant experience. Strong preference will be given to those with Big Four and international consulting firm backgrounds. Relocation packages for those from other markets will be considered. Qualifying individuals should submit an experience summary to: nklein@conwaymackenzie.com. PETITION LLC, in conjunction with the one-year anniversary of our Membership launch, is looking to expand the team. Specifically, we are looking for a Chief Strategy Officer (or other commensurate title) to help take PETITION to the next level. The right candidate must be entrepreneurial, commercial, creative and, frankly, not too “corporate.” She/he must be willing to get her/his hands dirty in all aspects of the company, including, first and foremost, leading new strategic initiatives, but also engaging in sales, research/production, administration, etc. We will look at all candidates but financial advisory, legal, and/or journalism experience is preferred. Current Members will also get first look (logically, Members have a much better sense of what we write about and what we stand for). Email us at petition@petition11.com and write “PETITION CSO” in the subject line. Nothing in this email is intended to serve as financial or legal advice. Do your own research, you lazy rascals.